105-107 is to the far left. I have to take somewhat of a piecemeal approach to the east side of the 100 block of S. Mangum St., as there isn't a very complete early shot of the streetscape. Below, looking north from the tracks on Mangum St., you can see the mix of brick structures replacing the earlier wood, frame structures. The Italianiate window style (curved at the top) on the brick building would be a repeated architectural element in this block. 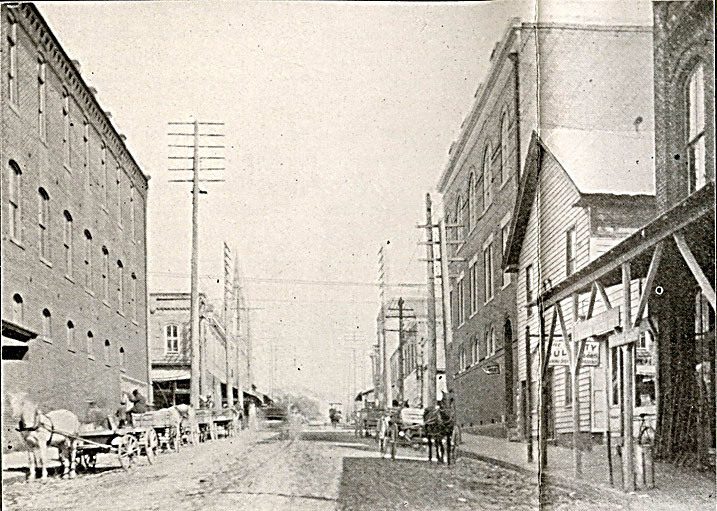 This picture predates the construction of the Citizens' Bank on the southeast corner of Mangum and Main; the brick building on the right side of the street near the end of the block in this view would be replaced by Citizens. This shot is all I can get from the 1920s, and only some of that repeated Italianate window pattern is visible, sort of peeking through in the right-middle portion of the shot. 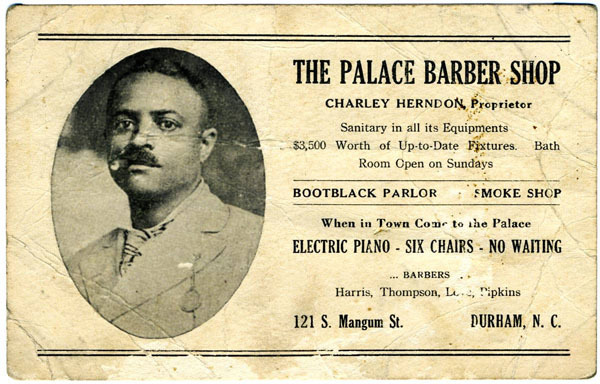 One business in this block was the Palace Barber Shop. 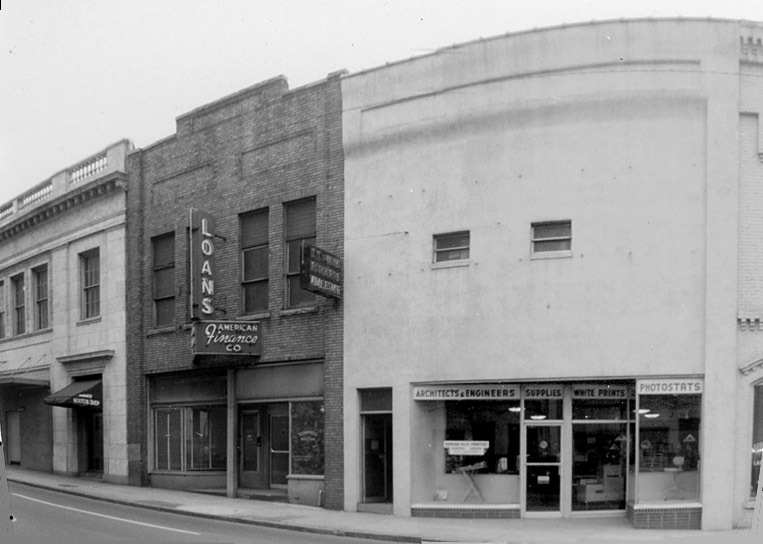 Both sides of the street in the 100 block of South Mangum Street featured several establishments catering to African-Americans in the segregated era - the Lincoln Cafe on the west side, and the Palace Barber shop on the east side were two of these. Per one oral history, the primary patrons were African-American workers at the American Tobacco Company. Looking northeast from South Mangum and the railroad tracks, with the Palace Barber Shop visible on the corner. A great shot below, but with little of the 100 block. A train pulls out of Union Station in the 1940s. 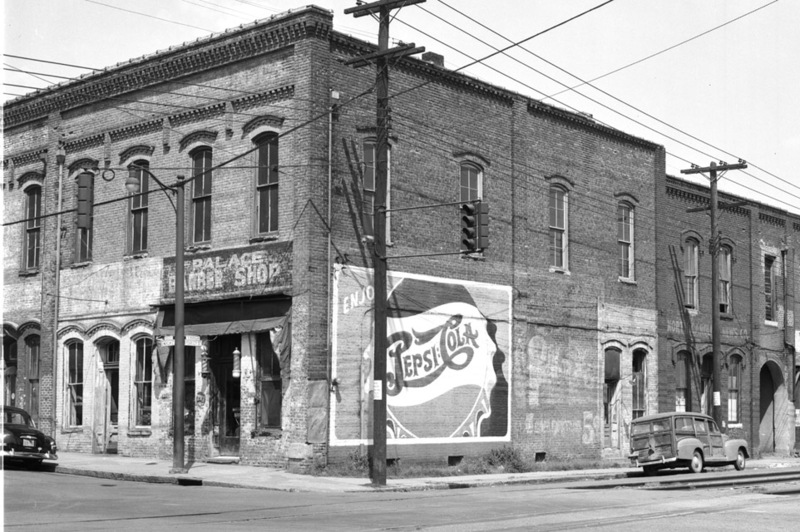 The northwest corner of Mangum and Peabody (later Ramseur) is the "Palace Barber Shop", with a bit of 117 S. Mangum St. visible as well. The following series of shots show the block in 1963, where several of the buildings had been converted to a stark, modernist style. 109-111 S. Mangum. Pardon the distorion in the upper right - I merged two old photos that were never intended for merging. The modern building was likely the Italianate building in the 1905 shot. Moving, south, 115 S. Mangum, complete with all of its original detail. And moving south to the corner of Mangum and Peabody (Ramseur), another modernization. Looking north at the intersection of Peabody and S. Mangum - from Pettigrew, 1966. These buildings were urban renewal-ized in the late 1960s, and this land became the western end of the Church St. parking deck.